oh dear!! This was similiar to the kiss at the wedding in the weekend. Another wedding in the weekend and the pressure builds for Ozy Mandias to write another blog on the event. At yesterdays traditional ‘post wedding BBQ’ I was fielding calls left, right and center about my impending article. Talk about pressure. However, I rest in the knowledge that when you have two people like we had in the weekend getting married material is never hard to find. Right from walking into the beautiful St Mary’s church this wedding had a special feeling. Officiating proceedings we had a tag team of ministerial powers, something which seems to be common nowadays. First into the ring was Leo the Lion dressed in the shiniest suit I have every seen. He opened proceedings well and then tagged in his partner. Immediately I could tell this was a woman not to be messed with. You don’t wear rainbow colours like that and lack self confidence, nor a sharp tongue. She concluded the service nicely, taking a record 15minutes to complete the signing of the registry. I think she included her skype username, facebook address and twitter account details!!! However, she did blot her copy book slightly by forcing Jason the groomsman to clean up the pool of sweat that he left on the alter following the service. One more comment needs to be made on the service and that was the first kiss between the happy couple. The first kiss is the pinnacle of any wedding ceremony. The formalities are completed, the legal requirements ticked off and everyone is ready to relax and celebrate. The kiss symbolizes the first connection between the married couple. I will attempt to recreate the situation and paint the best possible picture for those that weren’t there. Reverend Rainbow had just finished writing her details in the registry. The bridesmaids were back in place and the groom and bride where now centre stage holding hands. Jason shuffled awkwardly in the background as another bead of sweat headed southward. The congregation waited in anticipation as the Rainbow Reverend put aside her book and tried to smile at the young lovers. The music started to play in the back ground as the lighting was lowered. Amazingly, a single, golden ray of Christchurch sun shone through one of the many stained glass windows illuminating the couple. It seemed as if God himself had broken into the world and orchestrated this moment with his own hands. Perfection. “You may kiss the bride.” Were the words uttered as Reverend Rainbow stepped back to shun the limelight for the first time since Thursday night. Women gazed, anticipating the connection of lips, many starting to shed a tear, happy to be part of such a spiritual moment. Men nodded with sly grins, watching, hoping, and remembering their own marriage kiss. The bride leaned forward, eyes closed…anticipating. The congregation leaned slightly forward, joining with the bride’s anticipation. The world was in slow motion and then the groom started his move. Slowly he tilted his head and bent down towards his beautiful bride savoring this God given moment and then out of the blue he just opened his eyes and gave her a peck on the lips. Reverend Rainbow and Leo the Lion were both gob smacked. I was equally baffled as I see more action doing my lunchtime duty at my coed secondary school than I just witnessed with my own eyes. The congregation looked around, speechless. Jason used this brief uncertainty in the crowd to adjust his sweaty nether regions. To be honest the rest of the day was pretty much normal wedding fodder. The function, held at Annies Wine Bar, was sensational. 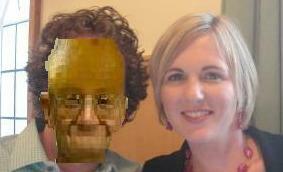 The evening was expertly developed by a Shem Banbury who held the evening together like superglue. He was everything a MC should be funny, compassionate and friendly. I would recommend him for your next wedding. Another highlight was an innovative lollie bar that the bride had developed for the reception. Imagine your own personal pick’n’mix without the horrendous pricing and this is what we had. It was fantastic and the only problem was half the people at the reception were Dutch. Nothing wrong with Dutch people but given the opportunity to take anything for free and they are like dogs with a bone. When I finally got to the lollie bar it was a bare tree stripped of all its leaves. It would be remiss of me not to mention one final point in this written dribble. I am actually related to the groom and so therefore I would like to comment briefly on the family that he is marrying into. 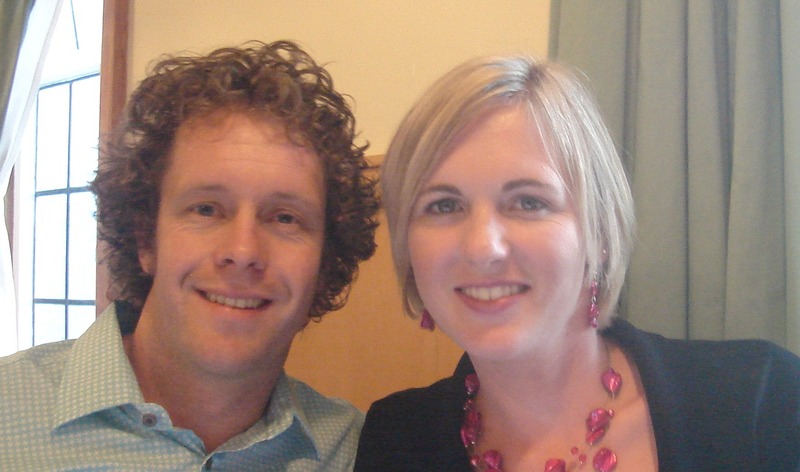 You will have heard of the Dutch Dirkzes family from Christchurch. I can state this without hesitation because they are without equal the loudest family in Christchurch. You may not have meet them but you would have heard them. They are so loud the Christchurch City Council has a bylaw require they family to live beside the railway line so they at least have competition 7 times a day as the train rumbles passed. So it will be interesting to see how our wee groom handles life in such a noisy environment. My advice would be at any further family functions to mix with the Bride’s Papa who at 96 years of age was a breath of inspiration at the Sunday barbeque. His beautiful GRACE was moving and capped off a great weekend. Furthermore, at 96 years of age he still drives a manual and most importantly he does mind a minute or two of silence in between the trains rumbling passed. Cross cultural marriages are interesting events. They bring together two cultures, two diverse backgrounds, two languages and blend them into one. Add to this excessive amounts of male crying and you have one very interesting wedding on your hands. As you can guess from the beginning of this post, yesterday I was fortunate to go to a family wedding which included both of these elements. Without wanting to give too much away I would like to look at these elements separately. The first issue we should look at is cross cultural marriages. If we look back through the history of humanity cross cultural marriages are only a very recent occurrence. Sure there are the odd examples of this throughout the ages but it hasn’t been until the last few decades that these have become the norm. One of the key aspects to a cross cultural marriage is the use of language. This was evident yesterday as snippets of the service and reception where given in Japanese. I like this in a wedding as language is important for all cultures. Sure there were a few issues yesterday, especially when Rev Coster came up to ask for the parental blessing. Little did he know the similarity between the Japanese word for ‘permission’ and the phrase used to order fish n chips for a takeaway bar. Being a fluent Japanese speaker I felt it was inappropriate to point out that rather than ask for marital permission he asked for permission to order 3 fish and 2 scoops of takeaways. Incidentally, he did what anyone should do when speaking a different language, and gave the sentence without hesitation and delivered it as if he had lived on sushi all his life. Secondly, let’s tackle the broad but important issue of males crying. Being bought up with only one female in the house crying was seen as a weakness. To cry was to be seen as being vulnerable and exposing one’s soft underbelly. However, thanks to the gradual feminization of our society, a male crying is actually seen in a different light today. In 2004 a study by Kleenex found that 90% of women and 77% of men think that it is okay to cry. That figure would only have risen in the last 5 years so it is now safe to say that to cry is to be male. 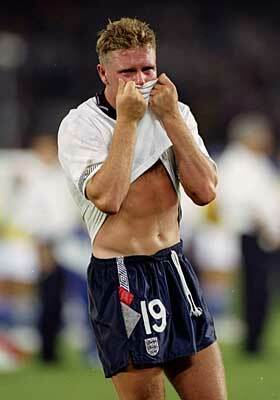 Many sociologists believe that the TV images of England soccer player ‘Gazza’ crying after losing a World Cup soccer game as the pivotal moment in man’s crying emancipation. This freedom we now have for males was pleasing because at yesterdays wedding there wasn’t a dry male eye in the chapel nor at the reception. The first to choke up was the minister during the ceremony, despite his experience in wedding officiating he still managed to shed a tear halfway through the vows. Next up was lemon boy. Nobody knows why he started to cry, as he was the driver of the wedding cars, although he used the line of getting lost as his excuse for a little water works. The reception was a particularly emotionally affair and basically a torrent of males crying. The groom’s speech given in pigeon Japanese (is there such a thing) was delivered with a unique mixture of laughter and tears which was something I hadn’t seen before. Finally we had the traditional King song which once again bought tears to eyes of every male in the room. The jury is still out on whether they were tears of joy, sorrow, embarrassment or pain. I suspect the later. Despite my anti crying upbringing the atmosphere got to me and I will be honest I did shed a tear at one point. The reason for this is due to the special bond with the groom. I don’t want to brag but I have known the groom for longer than any person, except his mother and the doctor who bought him into the world. You see we were born a day apart in Blenheim hospital about 30 years ago. Separated at birth, we finally found each other, and to complete the circle I married his cousin. Strangely though our devotion to one another doesn’t’ stop there. A quick glance at our wedding rings reveals the same taste in ‘two for one’ purchases from Michael Hill Jeweller. However, our real bond is based around dates. With yesterdays wedding being on the 12th December our wedding dates are only one day apart as well. As you would expect the next milestone we have to align to keep this run going is children. I already have set two dates in the calendar with one born on the 27th October and the other the 16th May. Without wanting to put too much pressure on the newly married couple if we move back 9 months from those dates the stars align on the 27th Feb early next year. Therefore, a personal request I would ask that you stay away from the bride and groom during the last week of February and as I precaution I have pencilled in a ‘C’ section at Christchurch Women’s Hospital on the 26th October. Today, the 13th day of December, is our 6th wedding anniversary. It is hard to believe that 6 years ago we started this little adventure together. In that time we have done many things, been to many countries and seen many sights. I have loved every minute (even when you steal my last little bit of ice cream from my bowl). Firstly I would like to thanks you for putting up with me for all those years. You have supported me in my hair brain ideas and pretended to be interested in things that I think are important, especially this blog and my sports. You have continued to love me when many other people would have stopped and given up. Mrs Mandias I love you more today then when we made our vows 6 years ago. You are beautiful in both body and spirit. Your determination and cheerfulness is contagious and I love spending time with you. Today you still make me laugh, your smile still lights up a room and I love the many hours that we spend together. You are a fantastic mum and our wee boys are blessed to have you as their guide, teacher and corrector of my mistakes. It is my prayer that the next 6 years are just as enjoyable and rewarding as the last.